The CA-2500 2D Color Analyzer is an innovative instrument capable of efficiently measuring the distribution of luminance and chromaticity of multiple display devices simultaneously. The CA-2500 2D Color Analyzer is an innovative, fourth generation, 2D Color Analyzer from Konica Minolta. It is also the successor to the CA-2000 2D Color Analyzer. The CA-2500 is an ideal instrument for evaluating luminance and chromaticity mura (non-uniformity) of a variety of display devices, such as LCD and OLED displays, and other light emitting devices such as automobile instrument panels and illuminated keypads. Unlike conventional imaging colorimeters that use RGB color separation filters, the CA-2500 uses XYZ filters that closely match the CIE 1931 color matching functions. This provides luminance and chromaticity measurements that correlate well with human eye sensitivity. The CA-2500 2D Color Analyzer now comes with an improved minimum measurable luminance range (0.05 cd/m²) and is more durable, with service life measurement cycles of approximately 5 times that of the predecessor model. Furthermore, the new Data Management Software CA-S25w (included as a standard accessory of CA-2500) provides simple measurements. This is made possible by the introduction of the focus assist function, positioning assist function, and the automatic measurement area extraction function in the software. The software is also capable of measuring multiple samples simultaneously and provides evaluation results for each individual sample, resulting in greater measurement efficiency. Click here to watch the CA-2500 product video. XYZ filters provide high correlation with the spectral response of the human eye – uses XYZ filters that closely match the CIE 1931 color-matching functions to provide luminance and chromaticity measurements. 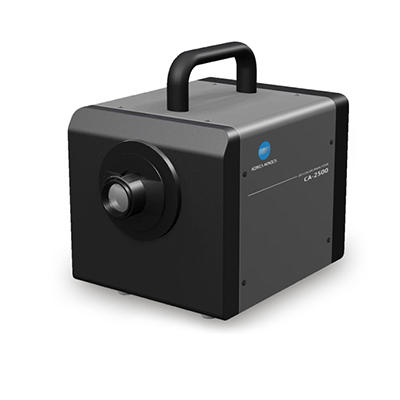 Expanded low-luminance measurement range – minimum measureable luminance has been Improved from 0.1 cd/m² to 0.05 cd/m². Interchangeable lenses for measurements of various subjects are available. Advanced Data Management Software CA-S25w, as a standard accessory – focus assist function, positioning assist function, and automatic measurement area extraction function greatly simplify troublesome measurement preparations. SDK (software Development Kit), as a stand accessory, used by customer to efficiently create their own software for controlling the CA-2500. Capable of simultaneous measuring of multiple samples. 210mm / 500 mm Approx. 410mm / 500 mm Approx. 275mm / 2,000 mm Approx. 440mm / 1,000 mm Approx. 850mm / 1,000 mm Approx. 420mm / 3,000 mm Approx. 890mm / 2,000 mm Approx. 1,770mm / 2,000 mm Approx.